Mrs. Obama deliveres remarks at the ceremony. Click image for a larger view. 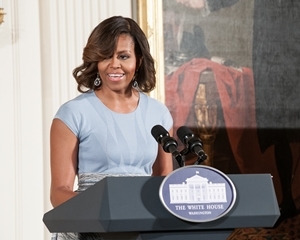 Washington, DC – This morning, First Lady Michelle Obama joined Institute of Museum and Library Services Director Susan H. Hildreth to present the 2014 National Medal for Museum and Library Service to 10 exceptional museums and libraries that have made a difference in the lives of individuals in their communities. This is the 20th anniversary year for the National Medal, the nation’s highest honor given to museums and libraries for service to the community. Brooklyn Botanic Garden, Brooklyn, N.Y.
Chicago Public Library, Chicago, Ill. The Children's Museum of Indianapolis, Indianapolis, Ind. Las Vegas-Clark County Library District, Las Vegas, Nev.
Mid-Continent Public Library, Independence, Mo. Sam Noble Oklahoma Museum of Natural History, Norman, Okla.
Yiddish Book Center, Amherst, Mass. The First Lady presented the National Medal to the museum and library directors and to community members from each institution, to recognize the extraordinary contributions they have made to their communities. Selected from nationwide nominations, medal winning museums and libraries demonstrated innovative approaches to public service, exceeding the expected levels of community outreach. Later this year, StoryCorps – a national nonprofit dedicated to recording, preserving, and sharing the stories of Americans – will visit each winning institution to document stories from their communities. The next deadline for nominating a museum or library is October 15, 2014. Learn more about the National Medal at www.imls.gov/medals. Editor’s Note: Additional photos from this morning’s ceremony are available upon request. Please contact Adrienne Lee at alee@susandavis.com or (202) 414-0788.